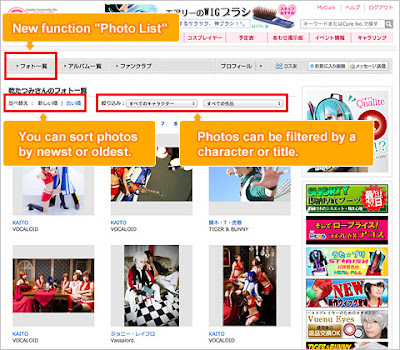 Cure Blog: New function "Photo List" page released! New function "Photo List" page released! Thank you for using Cure! You can easily look through all photos uploaded by a specific cosplayer. 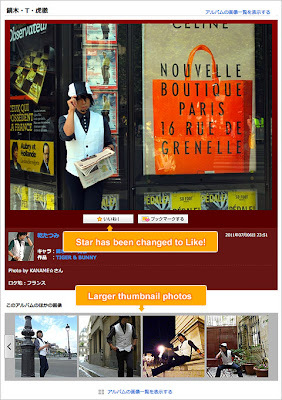 It is also possible to filter all photos by a character name or title. ※Fan Club only photos will not be shown to anyone other than Fan Club members. ※Photos with limited privacy setting will not be shown. displayed more beautifully and users can see lots of photos easily. Star has been changed to Like! color "aqua" in the "Album Edit" page. We hope you like our new design. Thank you!